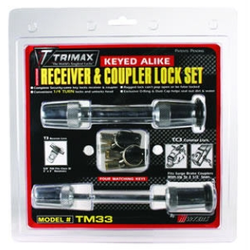 Keyed alike set includes one T3 and one TC3. Type A key which is a spring loaded, 7 pin, high security key. Resists attempted drill outs. Rugged and durable, the key will not bend or break. A receiver pin is used to secure the receptacle part of a trailer hitch (attached to a vehicle) to inserts such as ball mounts, drawbars, accessory carriers or ornamental receiver plugs. The most common receiver pins are 1/2" and 5/8" in diameter. Class II receiver hitches have 1 1/4" receptacles and use 1/2" pins. Class III, IV and V receiver hitches have 2" receptacles and use 5/8" pins. A coupler is the forward most part of a trailer tongue that envelopes and secures to the tow vehicle hitch ball. The lever on the coupler both allows the ball to be received into the coupler and prevents the ball from being removed. Accordingly, a coupler lever lock prevents the lever from moving into the open position. For maximum security when a trailer, boat or RV is not hooked up to a vehicle, a coupler lever lock should be combined with an unattended trailer lock such as the UMAX 100 or UMAX 50.